Important: These are not plans for making this yourself. These are the directions that came with this trick when it was on the market for $495.00 in the early 2000s. This PDF is designed for collectors who may have the prop, but no directions, magic historians, and those simply curious as to how this trick was done. The trick still shows up on eBay, magic flea markets and auctions. If you need the directions, then here they are. 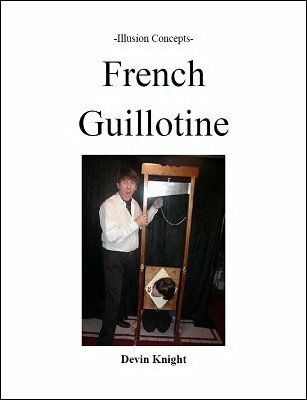 This solid, realistic guillotine stands almost 6 ft high. This sinister instrument is made from solid wood and built like a fortress. Must be seen to be feared. A victim is imprisoned by the neck in the stock and the blade thunders down going through the person’s neck and leaving her unharmed. Folds down small for packing. High quality construction. A big illusion at a low price.